Are you ready to sell vintage? I remember my first vintage show. All of it, the good and the bad. It was a great experience, but I made some big money mistakes. To help new vintage vendors avoid them, here's a few things to keep in mind. I couldn't wait to do my first show! It's the experience that led me to where I am today. Can't go wrong being over prepared, right? Wrong. Less is more. Brought too much stuff to manage for a two-day show. Drove two vehicles, four hours each way. Ouch on the gas. Went far from home adding hotel expenses and food. Spent too much on full price retail display type items because I thought I had to have them. Picked a local market where I could learn without travel expenses. Taken my time on buying costly display things until I knew exactly what I needed. Realized that booth rent is not the only expense. Observed and noticed layouts and booths that were busy and taken notes. Started with only a few tables of stuff so I could observe other booths and customers. Talked to the promoter and other vendors and asked questions. My first show I thought customers would crowd around me, everything would be sold and customers would be so excited by my stuff they would carry me out on their shoulders chanting my name. Be humble and pay attention to what applies to your business. Make your own decisions on what shows you want to do. Not every market is right for all vintage vendors. Just like online, you may be better at selling on Ebay than Etsy. What did it take for you to reach that conclusion? When in doubt talk to the promoter. Your success is their success. Ask their advice on how to get started. Ask to be placed near dealers with a lot of successful show experience so you can get some pointers. Remember: When you ask other vintage dealers their opinions on a show you haven't done, their opinion can be skewed for many reasons. So while building relationships with your peers is a great idea, it's a business and you can't base it on opinion unless you are ready to ask them factual questions. This dealer may have more expenses, different merchandise or different price points than you. Do your research and figure out what's the right fit for you and your business. 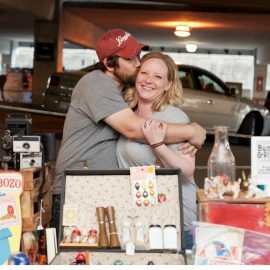 You started this because you have a great eye for vintage and knew you could make a business out of it. Buffy's Cool Collectible Rose Shabby Chipped Cottage seemed memorable, but now you hate it. Take your time in finding your niche and brand. Don't think you must name your business immediately; have cards made with your first and last name. Call yourself a vintage enthusiast and make sure your style shines through when customers come into your booth. Work towards the branding you want and when you are ready to unveil it, you will already have a following that will be excited for you! What's the Least You Need to Know to Sell Vintage? I hope this helps, and if you decide to take the plunge and decide to be a vintage vendor at the Vintage Garage, check out our dealer application. 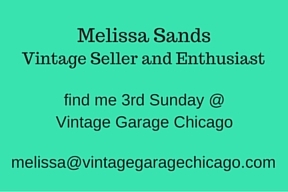 If we haven't met, I'm Melissa Sands, owner of Vintage Garage Chicago and vintage seller and buyer. I've loved the business of buying and selling vintage for a long time. 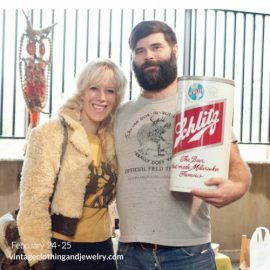 If you've never been to the Garage, check out the Vintage Garage on WGN. 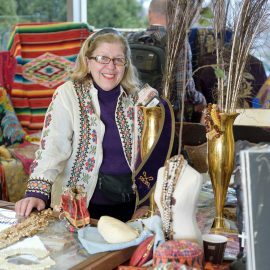 If you have a passion for vintage, learn about selling at the Vintage Garage Chicago.